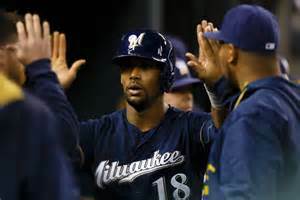 Milwaukee Brewers left fielder Khris Davis hit 10 home runs in the month of August. He was one of seven MLB players to hit 10 or more in the month, but he was also one of two players named Khris/Chris Davis to reach that number in the month… Baltimore’s Chris Davis also had 10 home runs in August. Davis (Khris that is) became the 16th Brewers player in the team’s history to hit 10 or more home runs in a month. The last Milwaukee player to do so was Prince Fielder who had 10 in June of 2011. Fielder was also the last Brewer to have 10 or more in the month of August; he had 11 in August of 2009. Fielder is also the team career leader in most months with 10-plus HRs with six. Ryan Braun and Gorman Thomas are tied for second with three months with 10-plus HRs. Here’s a look at the Brewers players who have had 10 or more home runs in a month. Fielder also holds the team record for most regular season HRs in a month with 13. He did that in May of 2007. The other by-month leaders for the Brewers: April (Braun and Lee, 10); May (Fielder, 13); June (Vaughn and Burnitz, 12); July (Braun, 11); August (Thomas, 12); September (Sexson, 12).